In our first ever group test, ProfessorBX wrote very nice letters to all the major manufacturers to ask for headphones. Once he'd fondled, groped, plugged, unplugged and generally disassembled each can in turn, he wrote down his findings and presented for your viewing pleasure as his deliberations. As the revamp of skratchworx gathers pace, I need your help to try something. I'm keen to use PNG images as they offer many advantages over JPEG and GIF. The one problem with using PNG is Internet Explorer for Windows - it doesn't handle them too well. So I've discovered some code that should enable them to be viewed. Please check this test page and see if the images appear correctly. Please report back in the comments with any issues you have. 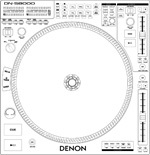 Been a while since a hot rumour has been posted on here but I just saw this on the unofficial Denon forum. Looks like the rumoured DN-S8000 is taking the form of a larger platter (guessing 9/10") and sharing much of the features of the small sibling 5000 model, this includes effects as well. And a much needed addition is an SD Card. No other details other than the picture and the forum post. 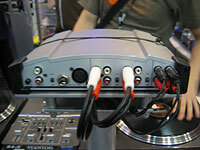 On the Vestax stand, we were treated to the new CDX-05 and TTM1 package, the first real QFO's in this country (i.e. more than one in one place at one time) and the new 05 Pro SL mixer. But also making an appearance were 2 products from the new G�ber "lifestyle" range. Denon showed their soon to be available new mini marvels - the DN-S1000 deck and the equally tiny DN-X100 mixer and the not so mini DN-X300 Rane-a-like mixer. Also on display were 2 out of the 3 new coloured faceplates for the daddy DN-S500 deck. As well as the rest of the range, including several CDX's, Numark showed their new DXMPro scratch mixer. Following the stylings of their current range, the DXMPro has the full compliment of features you'd expect in a good scratch mixer and comes in at a good price - �350. 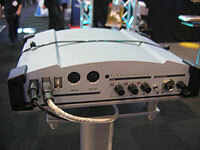 My trip to PLASA was just as much for mine and skratchworx benefit as it was to find out the latest news. And my trip to the Eclectic Breaks stand proved to be very beneficial all round. I found out all about the fader, saw the new bag and made some new friends at the same time. This crept on us out of nowhere really. Well not nowhere - we knew about it for a little while but didn't quite expect what we were about to see. FS2 comes at us with a brand new Scratchamp. Gone is USB and in comes Firewire. In fact, the whole Scratchamp is totally redesigned from the ground up - so much so that it's a whole Asio sound card in it's own right. So day 2 of PLASA... I started off with good intentions of visiting every stand and getting the hottest info. But the soon realised that at some point I've already told you about it in the news pages. There was some hot info - Stanton's Final Scratch 2. More of that in another post. As I wondered around chatting to people, I pondered on the relative static hardware scene and turntablism in general - a sentiment shared by pretty much all manufacturers. Read on for a fairly lengthy and rambling essay on why this might be. With the modem line in this scumlord hotel costing 50p per minute, this will have to be brief. Bullet points. Stanton have shown Final Scratch. Only crappy pictures right now, but more tomorrow when Jim from Stanton has hopefully dodged the hurricanes in Florida and made it over the pond. Nothing else new to speak of yet. Making a list and a assault plan and full coverage over the next few days. 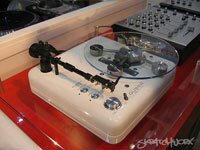 Here is the long awaited and near mythical review of the Pioneer flagship scratch mixer - the DJM-909. I figure that seeing as I'm meeting the Pioneer people in a few hours at PLASA and don't want a load of grief, I'd better do as as I promised and post the damn review up! I meant to post this last week but never got round to it. At the recent DJ Times show in Atlantic City, Pioneer had DJ 2ndNature do a short Pioneer DVJ-X1 demo - the results of which can be seen on this Promo Only page. Sneaking up on us out of nowhere comes the Pro X Fade from Eclectic Breaks. Premiering at PLASA, this fader offers tension and cut-in adjust and fits most mixers. A little while ago, I cast my beady eye over the entry level Vestax PDX-2000 mkII. Now I get to play with the top end of the range 2300 mkII Pro. Sharing the same base technology as the QFO, this beauty has a J-arm - a direct response to requests from dance DJ's who referred regular s-arms but wanted Vestax performance. But does it cut it for scratch DJ's? 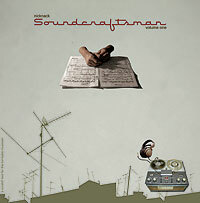 To celebrate the release of Nick Nack's excellent new scratch tool, 'Soundscraftman', Skratchworx has teamed up with Spin Science and TTR to bring you the chance to win a copy of the aforementioned tool. I'm pleased to announce some new blood for skratchworx. Please welcome on board Fingerlickin' B. 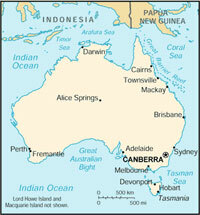 So why a map of Australia? Well that's were he's based so now we have coverage in the US, Europe and Australasia. 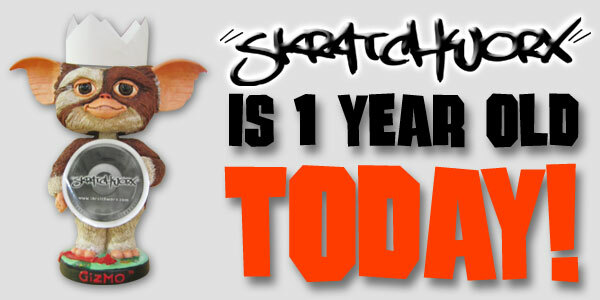 Skratchworx is truly global baby! But why get someone else in? Well firstly you can never have too many skilled people. Fingerlickin' B is well known and respected in the scene as being a bit of a guru and general tinkerer with hardware. One thing I do want to add to the site is a mods section and I feel I have the best people in the scene to provide such a resource. Also I've realised recently that I'm spending too much time unsuccessfully trying to do reviews and not finding enough time to develop the skratchworx site and develop new directions. I'll still do reviews from time to time but I need to get on with the business of moving skratchworx on. The skratchworx Pioneer 909 mixer reviews draws ever nearer, but as a warm up, here's a handful of short movies I prepared earlier. Nothing earth shattering in terms of skratch performance (c'mon - it's me we're talking about here :blink: ), more to do with functions.